The solution to selecting the right roofing company, consultant, or contractor is asking them the right questions. • Certified Roofing Company must pass a State of Florida Certification Roofing Examination. • Provides and passed a background check for the State of Florida. • Provided proof of financial stability. • Have a minimum of 4yrs. of prior roofing experience or a combination of college and roofing experience. • Obtained Public Liability and Property Insurance. • Acquire adequate Workers Compensation as required by law. • Have continuing education construction classes approved by the State of Florida’s DBPR to renew the roofing license. Classes on workplace safety, worker’s comp., business practices, laws and rules, and FL Building Codes. • Installation errors account for up to 50% of all roofing failures. • Proper training helps to avoid roofing installation errors and warranty claim denials. 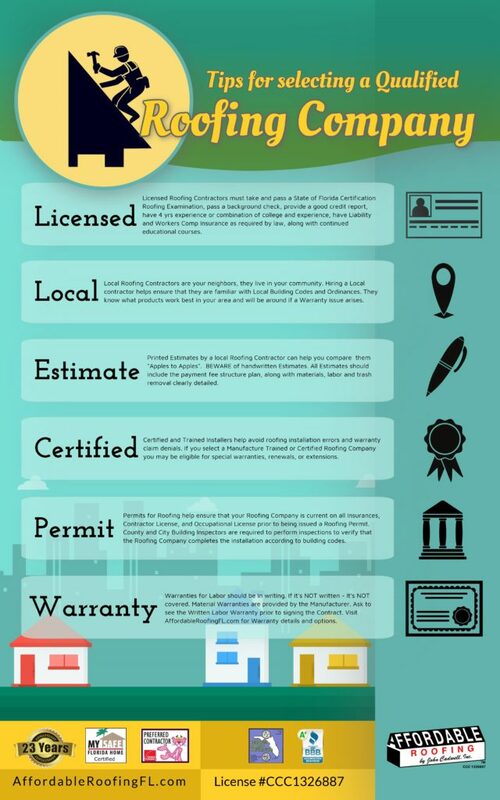 • Consumers that use a Certified Roofing Company may be eligible for special warranties, renewals, or extensions. • A roofing company looking to earn your business should have no problem providing you with one. • To compare your roofing estimates “Apples to Apples”. Several types of roofing materials are available so it’s important to get written estimates with the same roofing materials listed on each of them including the labor and cleanup. • Ask if your roofing company will price match. This helps to ensure that each of your estimates are equivalent. Contact Us for your professional estimate. • If it’s not in writing, it’s not covered. • Professional roofing companies should have the resources to provide a valid written labor warranty with assurances that are clearly detailed for your protection during your warranty term. • Local County or City Building Departments require current proof of the construction license, insurance, and requires them to be bonded prior to issuing a permit. • Building Department Inspectors are required to perform inspections to verify the roofing company completes the installation according to the current building codes. If your roofing contractor is can’t say YES to the above questions you probably shouldn’t trust one of your largest assets, your business or your “castle”, to them!